Fans of the late guidebook author Alfred Wainwright raised £10,000 for a conservation charity through sales of a calendar. 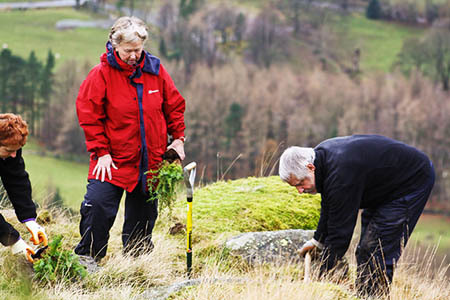 And the recipients, Cumbria Wildlife Trust, revealed the donation has enabled them to secure £100,000 worth of funding for its Uplands for Juniper project. The Wainwright Society’s proceeds from sales of its annual calendar were handed over to Michelle Waller of the trust at the society’s annual meeting in Staveley near Kendal last month. She said: “The money from the Wainwright Society [has been used] to secure the grants from Wren and the SITA Trust landfill communities tax funders. This money has allowed a re-survey of all the stands of juniper recorded in a 1970s survey. The survey showed the health of the juniper trees has declined over the past 40 years. The trees are hosts for more than 40 species of bugs and insects and are important in maintaining the diversity of the ecology of the Cumbrian fells. During the past year volunteers have already replanted 3,000 juniper saplings with the result that the long-term future viability of juniper is now more secure. The Uplands for Juniper project, started in April 2011, will run for three years until March 2014. The Wainwright Society previously donated £2,000 to the project in May 2012, which was money raised by its annual charity challenge. Funds from Wainwrights books should go to footpatrh restoration given the enviromental impact his writings have created. Profits from Wainwrights book go towards an animal charity. Anyway, how do you know if erosion is caused by Wainwright readers or for example Mark Richards? The Wainwright Society contributed to Fix the Fells in a charity fundraiser a couple of years ago.